We're sweet on sweet potatoes this month. “Two sweets,” Burt Jefferson says to the walkabout food vendor at the skating pond in the 1942 movie “The Man Who Came To Dinner.” By sweets he means sweet potatoes, served hot in waxed paper as a snack. In the black and white film, Jefferson, played by Richard Travis, and Maggie, played by Bette Davis, have just stepped off the skating pond. They proceed to eat the sweet potatoes with their hands — like you might enjoy a hot pretzel — while sitting next to a bonfire. You don’t need to be in a black and white film — or at a fancy restaurant — to enjoy sweet potatoes though. And since they are in season right now, you can get locally grown ones to enjoy. But first, let’s clear up a few things. Sweet potatoes are not actually potatoes at all. This edible root belongs to the morning glory family. Yes, like the flowers. Also, don’t confuse sweet potatoes with yams, although they are sometimes incorrectly called yams in the United States. Real yams tend to be drier than sweet potatoes and come from a different plant species. Moreover, real yams are seldom grown (or sold) in the United States. Those canned ones that say “Yams” in big letters? They’re really sweet potatoes. Speaking of sweet potatoes, this nutritious vegetable is high in beta carotene and vitamins E and C. And it’s a good source of fiber too — as long as you eat the sweet potato’s skin. 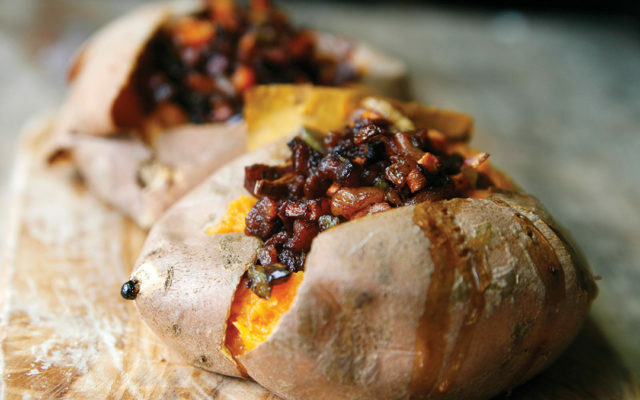 According to The New Food Lover’s Companion, sweet potatoes are best stored in dark, dry places around 55 degrees Fahrenheit. And they should be eaten pretty quickly — within a week of purchase or so. Now, who wants some sweets? Preheat oven to 400 degrees Fahrenheit. Wash and scrub the sweet potatoes. Prick each four times with a fork. Bake for 45-55 minutes, until tender. Remove from the oven and let cool. Cut a cross in the top of each potato. Squeeze to open. Use a fork to mash the flesh. Season with salt and pepper and mix. In a large skillet, cook the pancetta until browned. Remove the crisp pancetta to a mixing bowl, and drain the rendered fat from the pan, reserving 2 tablespoons in the pan. Add the shallots, carrots and green peppers to the pan and saute until crisp and browned, about 8-10 minutes. Drain and add the veggies to the pancetta. Mix well. Divide the topping evenly among the sweet potatoes. Enjoy.